A dedicated Wisconsin deer hunter bucks the odds and finds success during his rookie season in the DIY Wyoming elk woods. Easing to the edge of the small drainage where I last heard him bugle, I stopped and surveyed my next move. Somewhere the whitetail hunter in me knew I’d find a way to squander another opportunity on DIY Wyoming elk; mistakes had been the theme of the previous six days. The bull gave a loud, earth-shattering scream as he made his way into the small meadow. The vibrations of his chuckle resonated within my chest, and you could see his breath pierce the cool morning air. This was the reason I had come to Wyoming from Wisconsin. As a rookie elk hunter, I was staring down an 800-pound ghost. All the poor decisions I’d made during the previous week were starting to melt away as I eased to full draw on the big bull. Western big game hunting for a whitetail hunter can seem like a daunting task, but it’s a rewarding one if you embrace the process. With dedicated research you can shorten the learning curve and be successful. Enough material has been presented on large-scale western hunting, and my hope was to decipher the small details that often get overlooked but make the difference between coming home with a punched tag or an empty cooler. Don’t underestimate local knowledge. Whether it is through online forums, state game and fish agencies, game wardens or the local wildlife biologist, it’s a great idea to reach out and ask for help. People are willing to help if you do some homework beforehand. It’s difficult getting useful information by asking, “Where are the elk?” A generic question will result in a generic answer 100 times in a row. My local knowledge for my first DIY Wyoming elk hunt was a cousin who had hunted the area previously. I utilized him and the local biologist to come up with a game plan. The fitness aspect can’t be overstated, but don’t let it be the reason you don’t go. Look into a desert unit with lower elevations if you’re concerned about your endurance. In our case, we arrived at the trailhead our first morning with full packs and high expectations. I was all smiles — first time in elk territory — and the weather was perfect. I had no idea what one local meant when he told me that this area had light hunting pressure due to the brutal terrain. Ignorance is bliss. Realistic expectations are important. I would be happy with any bull that gave me the opportunity to squeeze my release. What is considered a trophy to me might not be to someone else, and there is nothing wrong with that. I get annoyed when people go on forums and apologize because their bull scored only x amount of inches. So dumb! If you’re happy with what you shot, that is all that matters. Any elk with archery equipment is a trophy in my opinion. The first major mistake of my DIY Wyoming elk hunt came from being too aggressive, most notably spending too much time hiking through bedding areas. Despite our intentions, we ended up blowing too many opportunities, which led to inconsistent hunting initially. Day No. 2 found us sneaking through an elk bedding area when my brother-in-law, Mitchell, stopped because he could see a bull feeding below us. Instead of sneaking in for a possible shot, we rushed to get ahead of the bull. We needed to do a better job of reading the situation and knowing we were in a perfect spot-and-stalk scenario, with favorable thermals and an unsuspecting bull. Soon after our end-around attempt, we were met with antlers busting through branches. Two disappointed first-time elk hunters had learned a valuable lesson. For a flatlander coming to high elevation for the first time, it’s important to take the first few days to get acclimated. That doesn’t mean you can’t hunt. In fact, glassing and listening could pay dividends later in the week. During our second day, Mitchell and I realized we had gone too hard, too quickly, which resulted in raging headaches and lack of desire to hunt. On day No. 4, we glassed four bulls in a west-facing drainage, with a location that presented itself favorable with the ascending thermals. It was my turn on the bow and Mitchell was the caller. Not long into the morning we had our first close encounter with a bugling bull. I drew my bow and gave the beautiful 6 point a nervous grunt as he entered my 40-yard shooting lane with Mitchell calling behind me. I settled my pin behind the bull’s shoulder and began squeezing my release. I could envision my arrow slicing through the elk’s vitals. Only that’s not what happened. The arrow dove harmlessly below his chest, and I crumbled to the forest floor. I couldn’t figure out what happened; there was no bull fever, the shot was smooth, and I didn’t punch the trigger. The answer was simple and more maddening than one might think. I tucked my bent broadhead back into my quiver and was disgusted to see that my bowsight had moved up a full inch. After a 5-mile roundtrip hike to get an Allen wrench, I was back in business. The hike was long, and a lesson was learned: Pack a set of Allen wrenches whenever you’re going in deep. It’s easy to get caught up in a rut-crazed bull and think you can ignore the thermals. Don’t forget the wind. Let me repeat that: Don’t forget the wind. Following my miss, my dad was the next man up and we were greeted with three screaming elk within 150 yards. Instead of waiting a few minutes for the thermals to stabilize, we snuck in tight and challenged them. It was once again another encounter that ended with wiser bulls and disappointed archers because of another mistake. After a litany of mistakes, you begin to question yourself. You actually start to believe that all the mistakes are insurmountable, and you start daydreaming of a warm bed and hot food. Mentally our errors were beginning to pile up, and I was letting it affect my hunt. Staying focused is difficult when everything goes wrong. One morning I was sitting near a wallow when a bull fired up 300 feet above me in elevation. It didn’t end with a tag punched, but I was able to push within 40 yards of the bull multiple times and turn him from his cows with challenge bugles. As the small herd made their way from their feeding grounds to their east-facing bedding area, the thermals were growing inconsistent with the rising sun, and I finally made the right decision. I played it safe and left the herd for more favorable winds. One correct decision led to another. As we glassed a south-facing slope, a separate bull fired up several hundred yards to the west in response to a location bugle from the opposite ravine. I suspected that the location bugle came from another hunter. We had chased a phantom bugle earlier in the week only to stalk up on another hunter, so this time I planned to utilize his presence to our advantage. This is something all whitetail hunters can relate to on public land. I knew that in this north-facing basin the thermals stayed consistent for the majority of the morning, and this is relatively dependable for mountain hunting in general. 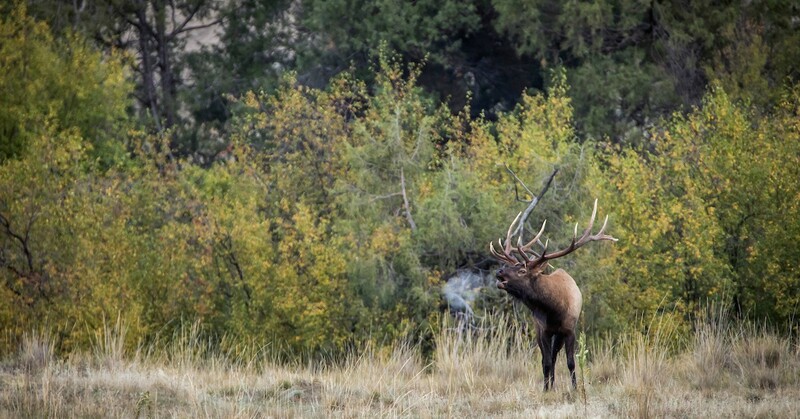 Most of my elk hunting idols believe in getting close before making your presence known. Luckily, this bull and the other hunter obliged with an occasional bugle that allowed me to further pinpoint the elk’s position without being forced to call. I snuck across the mountain until I came to a small drainage. It was here that I was forced to make a decision. Do I cross or attempt to call the bull from here? I hadn’t heard him bugle in the last five minutes and was unsure about his exact location. I stood tucked into the tree-line and the big bull sounded off as he walked into the meadow. The decision was made. I nocked an arrow and started ranging shooting lanes. I went into auto-pilot and ranged the bull at 49.5 yards before I drew and settled behind his shoulder. I squeezed the release and this time the arrow sliced through the bull‘s vitals. My imagined and real-time images collided as the arrow disappeared behind his shoulder. I bugled at the fleeting bull and though he was over the ravine and nearly out of sight, he did stop long enough for me to hit him with a second bugle, which led to an earth-shattering crash. As with all animals, I gave him 30 minutes before taking up the trail because I didn’t see him go down. When blood-trailing I’m at a bit of a handicap being that I’m colorblind, but when the animal makes it only 40 yards from the original spot of impact, I can manage. By learning from his mistakes and keeping a positive no-quit attitude, the author was finally rewarded with a chance to loose an arrow. Despite making solid choices all morning, my next mistake could have been a catastrophic. It won’t happen again. I didn’t have a GPS along with me that morning, and though we did our best with simple landmarks, making trips to and from the bull while packing and hauling meat was very, very difficult and frustrating. This could have all been avoided had I had my GPS or even a kill kit that included colored flagging tape. Some reading this will say I simply got lucky — just a newbie DIY Wyoming elk hunter who came from Wisconsin and hit pay dirt. I won’t necessarily dispute that claim as I feel very lucky to have harvested this bull. But I will note that if you learn from your mistakes and keep putting yourself in enough favorable situations, eventually the stars will align. You just need to be ready to capitalize when it finally happens and that bull or cow is standing in bow range. Earlier in the article you read my thoughts about the importance of not blowing elk out of an area early in a hunt, but at some point it is acceptable to break this simple rule. During our final afternoon in elk camp, we were given a golden-goose opportunity when we fired up a trio of aggressive bulls. Despite my best efforts of challenging the three bulls, they would never get into the 40-yard opening for Mitchell to launch an arrow. We needed to press in even tighter to give ourselves an opportunity on our last evening, even if it meant possibly blowing elk out of the drainage. Sadly, the move didn’t earn us a chance to cut loose an arrow, but it did create an ultra-close encounter. When the hunt is in its final days, don’t be afraid to get ultra-aggressive. Parallels that you can pull from your Midwestern experience in the mountains do exist. Reading sign is eerily similar in both situations. Looking for well-used game trails, thick cool bedding areas, multiple rubs and using your nose for what a friend calls “smelk” (the smell of a rutting bull elk), can lead you to the promise land. Most archery setups for whitetails will work for elk, but I prefer a heavier arrow to get maximum kinetic energy, as well as practicing at longer distances. Finally, just remember that mistakes are going to happen — a lot of them. The reason I was successful was because I was able to learn from my mistakes during my week-long venture. No matter how many books and articles you read, you need to accept that things will go wrong. The mistakes can seem to snowball, but it’s important to take each of those for what they are — a learning experience. The only way to make and learn from those interactions is to take the plunge and head West, blunders are part of the story. That story never gets written if you don’t go. Wyoming’s hunting units are divided into limited draw and general; a general tag is good for a large percentage of the state. Of the tags that are allocated to nonresidents, 75 percent of the tags go to the highest point total, with 25 percent going into a random draw. Wyoming allows you to buy a preference point for $52 from July 1 to October 31, helping you avoid the $692 refundable license fee in January if you only want a point (non-refundable $15 application fee not included). The deadline for applying for a Wyoming elk tag is January 31, earlier than most other western states. Another thing to keep in mind is that unless you have a resident guide or outfitter, you are not allowed to hunt federally designated wilderness areas. The Cowboy State has an excellent user-friendly website as well as a hunt planner; click here to check it out and get started planning your own DIY Wyoming elk adventure today. Note: I didn’t talk about special and limited draw units in Wyoming because most Midwestern hunters will likely only enter the general draw due to the huge price hike/difficulty.